Korean skin care and cosmetics are well renoved and lately trends are slowly being embraced by some of the Western brands as well. I was chatting with Linda from Silverkis and she was telling me about her excitement of BB Cushions. Having not tried any of them, I was very curious. She generously gifted me a Laneige BB Cushion Foundation after that. I have been testing it since early December and each time I mentioned it on Instagram, I could feel the excitement of everyone else there. Today I would like to share my thoughts with you. Laneige is a South Korean cosmetics brand which is owned by Amore Pacific, which you may heard of. Lineage has now stores outside Korea as well, such as in Singapore, Thailand, Philippines, New Zealand,Canada and United States. Unfortunately they are not presented in Europe yet. Now let's go back to start, what is a cushion foundation anyway? In this context "cushion" is a large buffer, which can soak lots of liquid make-up product so you can dab a sponge and apply it on your face. This technique is not only used for foundation but also for blushes, eye liners and everything else you might think of which could come in a liquid form. It is said that the main idea behind all these is to have a watery glowing skin. 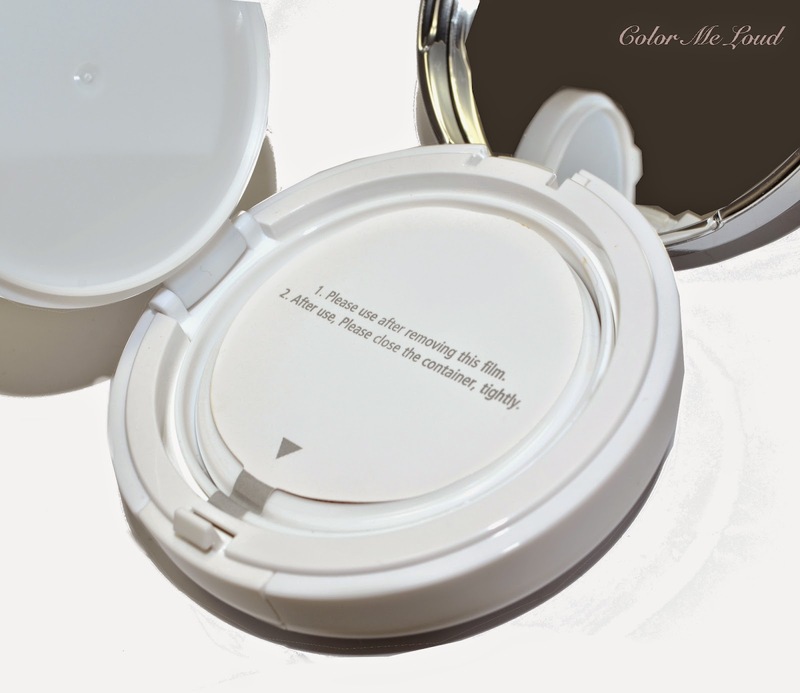 After you open the lid of Laneige BB Cushion, you see a protective film. You can easily remove that and start using your foundation. After you remove it however, the clock starts ticking, very similar to opening a mascara. I have found that since the film is sticky, you can stick it back and slow down the drying process of the product. I have opened mine in early December and it has still not dried down. After you remove the protective layer, you will see a bouncy cushion. It is induced with a lot of liquid. You can use the sponge/puff provided in the compact which is the recommended way to use it. Personally I find fingers a bit messy to apply it. My favorite way to work with it is by using a beauty blender. I dab the beauty blender on the cushion and tap it on my face. 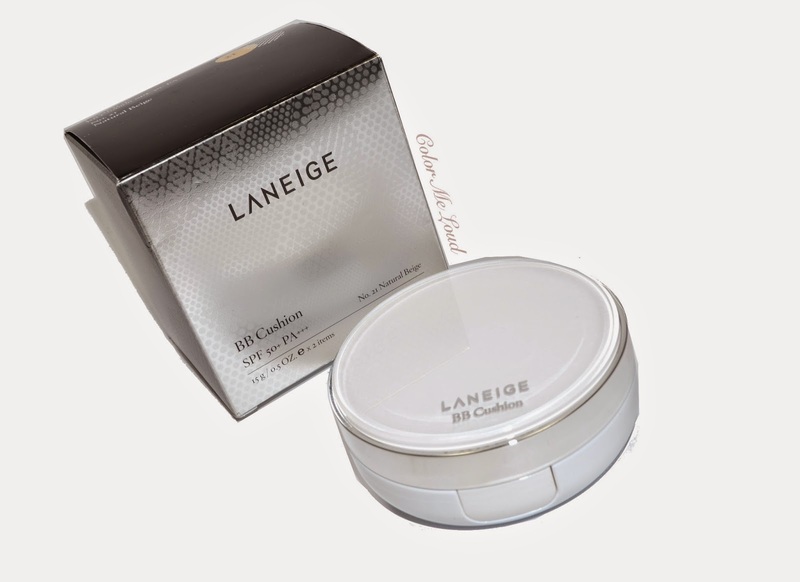 The first time I used it, I was wowed by the natural glow Laneige BB Cushion gave while providing a decent amount of coverage. I can get along with this one with very little concealer afterwards. The best thing about it is the build ability. 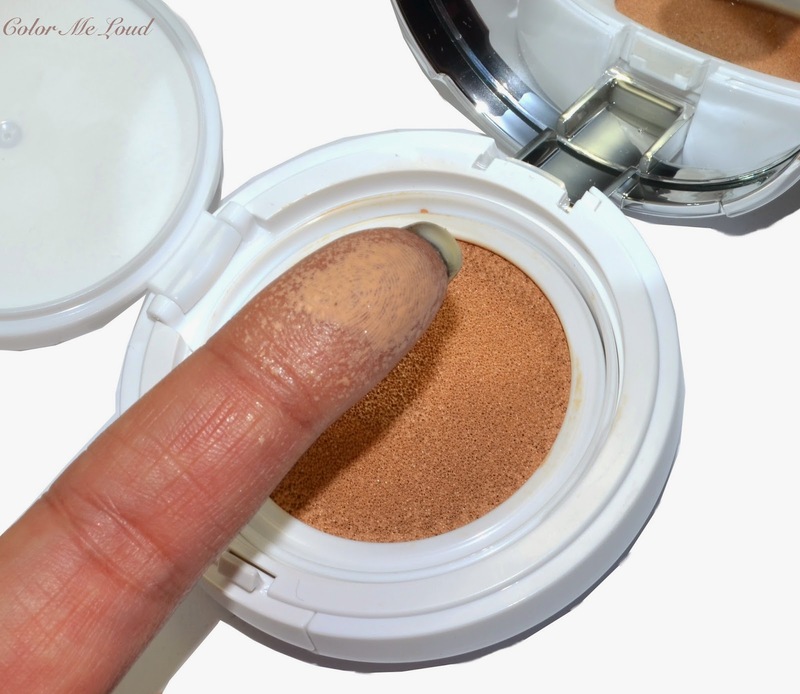 You can build it up to medium coverage without getting heavy on the base. I have No.21 Natural Beige and it is a great match for my NC20 skin. Once the cushion dries down, it is possible to get a refill and replace it. I have already ordered my refill from eBay, it is around $21 and shipping is for free. There are three different formulas, there is the plain BB (reviewed here) and the one I have ordered, which is called the whitening version. There is also a pore minimizing one, which I believe should be more for combination skin. 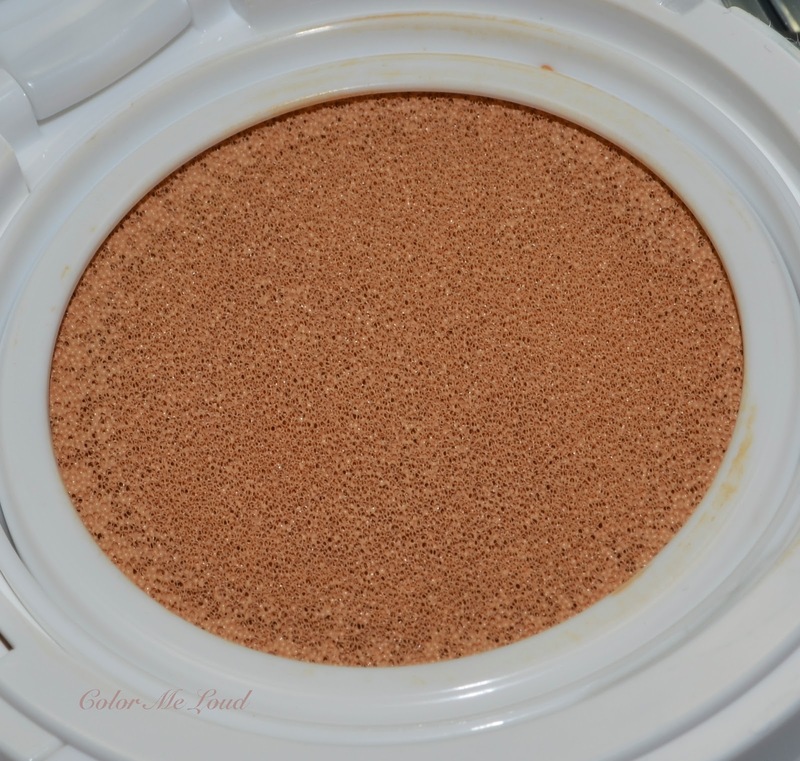 This one has SPF of 50, which I know I will love, especially in summer! A few more things to mention, the first package comes with a filled compact and a refill and costs around $50. The foundation has a bit of perfume but to my nose it is very unnoticeable during application but if some may be sensitive to that. I have previously posted a few FOTDs using Laneige BB Cushion SPF 50+ No.21 Natural Beige such as this one (check out the second FOTD). I have normal to dry skin and this formula is so good for me, it gives a healthy glow and it doesn't dry my skin. Below you can see left: bare skin, right: only Lineage BB Cushion (no concealer no makeup). 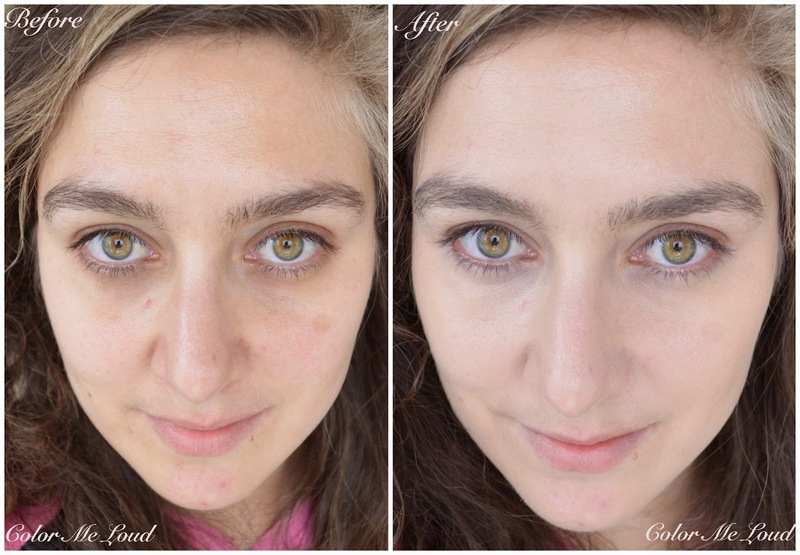 Do you notice how the foundation keeps the natural glow while evening out the skin tone? For a BB type of foundation, the wear time for me is also impressive. It doesn't last as long as say Tom Ford Traceless Perfecting Foundation but it does stay in place for an impressive 8-9 hours. Check out this video by Lisa Eldridge to see Laneige BB Cushion SPF 50+ No.21 Natural Beige in action. I also find their advertisements quiet amusing, you can check them out here. 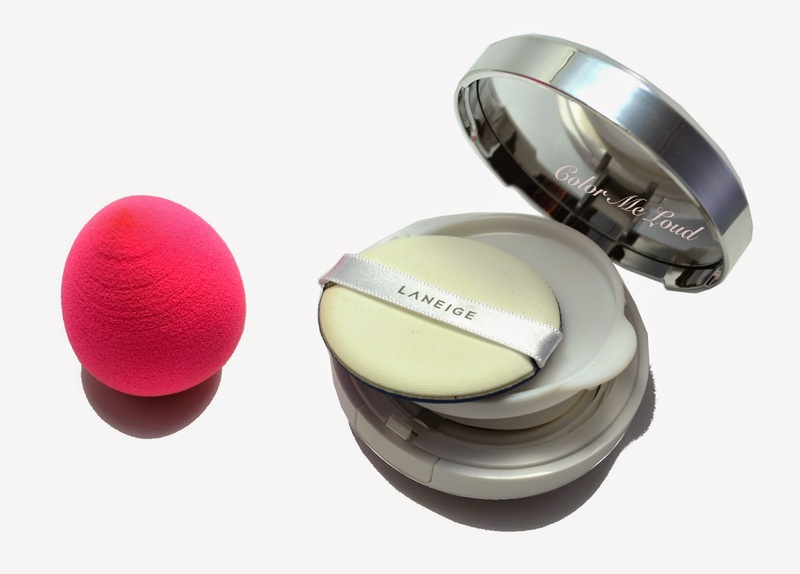 Final thoughts: If you are in the market for a trendy watery glow, without getting too heavy on the base and a foundation with good amount of SPF, be sure to check out Laneige BB Cushion. I believe the formula is especially beneficial if you have normal to dry skin. It is definitely one of the best base products I have came across during last year and enjoying to use at the moment. You can get Laneige BB Cushion from Target in the states (here, not affiliated). In Europe you can order it from W2Beauty (here, not affiliated). 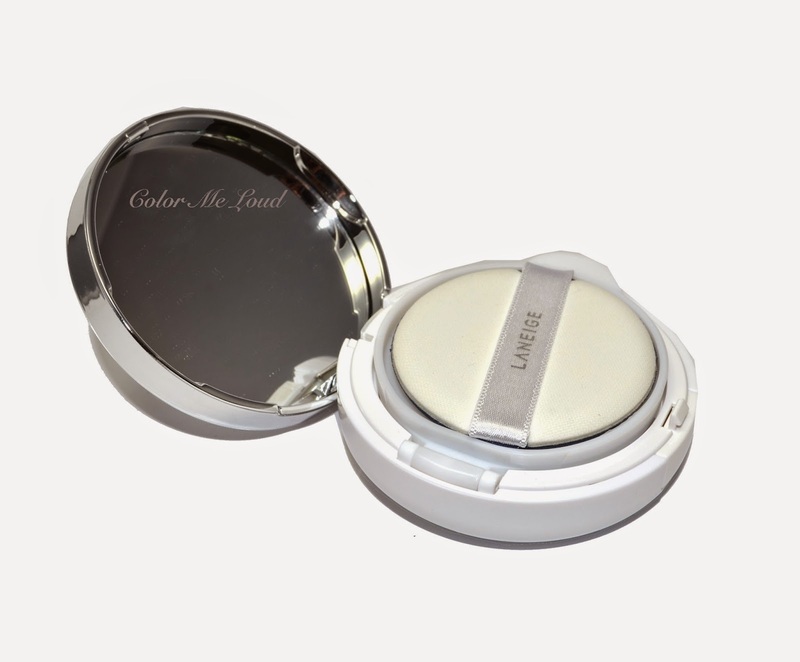 Lancome also released a cushion foundation, which I am testing at the moment. Review to that one is coming up soon. Have you tried a cushion foundation yet? Do you like the concept? Disclaimer: The product in this post was gifted to me by a friend. Hi Sara! I like these cushion things because they feel so light on the skin! I have the AmorePacific one which you linked to. The Laneige Brand is a great affordable option and they actually have it available in Target. The AP one is available here at Sephora as well as the department stores that carry AmorePacific. Arghh, I have messed up with links lol, thanks for pointing out! I have yet to try Amore Pacific's Cushion :-) Thanks for letting us know where to get them. I find this very interesting indeed, thank you for reviewing this and the Lancôme one. I see some good and bad aspects which you have pointed out: the drying out is a problem for us girls with several foundations but I love that it's SPF50 and that the coverage is natural and buildable. I'd be interested in the pore refining one as I have oily skin, I'm quite curious now! Great post and you look very glowing with this! hmmm...this is interesting. I wanna try this out. So curious about it. yay looks like we wear the same shade of foundations (or pretty darn close anyway) how amazing is that?! lucky you... no pores.... dont let other people hear that! lol yes many foundation launches this year. I tried Lancome and I like it. Only the shade is a little dark for me (#2). I am usually the second lightest but with Lancome it seems I had to go with the lightest one. I will pick up that one once I go for a refill. I'm glad these are becoming more mainstream, I love the idea. It looks very natural on you. Yes, great idea indeed. Thanks, I am loving the natural glow it gives. Thanks Jen, yes I think the coverage is perfect for me. I know what you mean about the cost of shipping. This trend will slowly come to our shores too. I already liked the first try from Lancome, curious about Sulwhasoo too. You can try Amore Pacific too, which is readily available in the states. Dear Sara, sorry for an offtop, but if I would have a skin as good as yours, I would really not bother applying any BB or foundation at all! :) Though, I really like the way it looks on you and if its formula would be silicone-free, I would order it right now. Btw, I think I saw something similar at Lancome counter today. LOL, I think you should maximize the photo to see all my pigmentation and spots, they are so dark :-( Not a good skin by any means, only I don't have many lines, which I am happy about. Unfortunately there are silicons in the formula... Yes Lancome just released one, I will review it in a few days. I need to visit this year too. LOL, I know, there are a series of fun commercials in which the girl is doing her makeup in 2.5 seconds or something. I found it very creative. This cushion looks very natural and pretty on you. I really do consider buying it in the same shade as you! ♡ thanks for your swatches! !